Get your Holy Week lesson ideas and Easter activities here at The Religion Teacher. It is the beginning a new year and for many of us that means . . . fun Catholic ice breakers! I know, I know, ice breakers aren’t always the most exciting things to do, but they are effective. You want to build a community as quickly as possible so you might as well have a little fun while doing it. Ice breakers are a great way to get to know new people in new situations. There is a lot that goes into staring the new school year off right. It is an important time for you to share your vision for the year. You want to get your students excited to be in your class and excited to come back again next time. At the same time, you want to get to know new student names as quick as possible. What better way to do that than with fun ice breaker games? Whether you are in a Catholic school, parish religious education classroom, or even a youth group, ice breakers can be a great way to get to know students’ names help them feel comfortable with a new group of people. Check out the following websites and ice breaker ideas to use in your class this year. Visit some of the Catholic websites below and pick and choose the best ice breakers for you. Scroll to the bottom for an opportunity to download five of my favorite ice breakers and the ones I will be using this year. I put together a one-page cheat sheet with five fun ice breakers that I like the most. It has brief descriptions of each one and they all help with learning new students names. Jared Dees is the creator of The Religion Teacher and the author of 31 Days to Becoming a Better Religious Educator, To Heal, Proclaim, and Teach, Praying the Angelus, and the new book, Christ in the Classroom. Have you signed up to receive the free eBook, The Religion Teacher's Guide to Lesson Planning? Whether you are a veteran teacher or in your first year, this guide provides a step by step process to effective lesson planning and provides 250 suggestions for activities and teaching strategies. Thanks Cathie! It has been my pleasure. Have a great year as well! God bless you for all you do to help all teachers at all levels, especially those teaching in a Catholic-Christian school…many blessings! 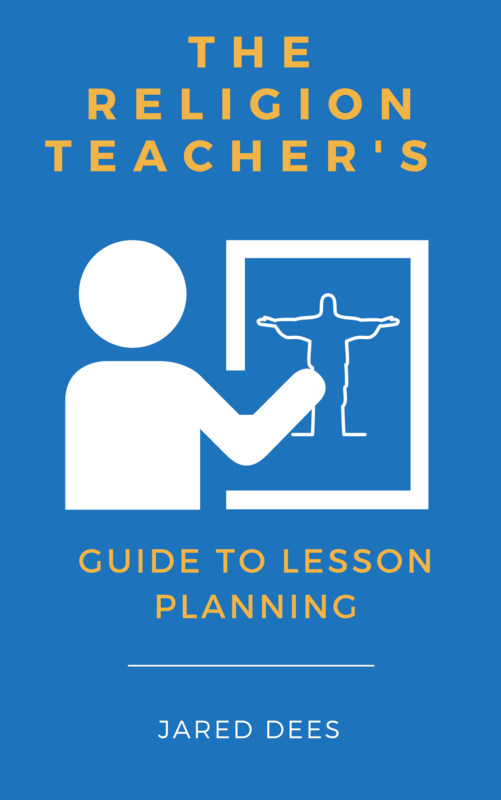 Get a free copy of The Religion Teacher's Guide to Lesson Planning and join more than 47,000 subscribers to The Religion Teacher. Jared Dees is the creator of The Religion Teacher and the author of 31 Days to Becoming a Better Religious Educator & Christ in the Classroom.